HOPE Chautauqua Coalition Members that are part of the CHQ Bright Spots Team. 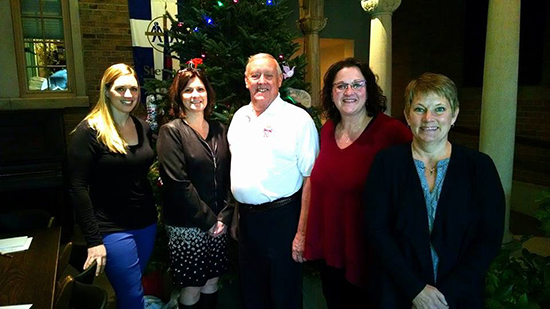 (L to R) Bree Agett, Renee Prechtl, Bob McDowell of the Knights of Columbus, Julie Franco and Krista Camarata. Have you been involved with or witnessed something good happening in Chautauqua County? Chautauqua Bright Spots is your opportunity to come tell us about those good things. We want to hear about successful initiatives throughout the region where people came together to improve the lives of our citizens. Whether the initiative was through an agency or organization or was more informal, we would like to hear what happened and what made it work. Chautauqua Bright Spots will be hosted by the HOPE Chautauqua Coalition on Thursday, January 21 from 5:30-7:30 at St. James Church, 27 Allen Street Jamestown, NY. A free light dinner will be included, free of charge courtesy of the Knights of Columbus Council, #926 and St. James Parish. This will be a community conversation, not a presentation. We hope that everyone who attends will be willing to share their thoughts about the good things that are happening in our community. You will learn the different “bright spots” or positive projects that are currently happening. In addition, you will meet other people who believe in our community and our ability to help our citizens be happier and healthier, which in turn, will help us inventory all the ways in which people are working together to improve the place we all call home. Please come and share your thoughts about what is good about our county! Please RSVP by January 14th to Laurie Reynolds, Chautauqua Alcoholism & Substance Council, by calling 716.664.3608, by email at laurie@casacweb.org , or on-line at http://tinyurl.com/ChqBrightSpots. Since 1974, CASAC, a United Way Community Partner, has provided prevention education and community awareness regarding alcohol and other drugs. CASAC is the only New York State Office of Alcoholism & Substance Abuse Services (OASAS) approved and supported alcohol and other drug prevention agency in Chautauqua County. CASAC is home to the HOPE Chautauqua Substance Abuse Prevention Coalition. For further information on joining HOPE Chautauqua call Julie Franco at CASAC’s Jamestown office at 664-3608 or email julie@casacweb.org.